I’ve had a few days to reflect on completing the Texas Water Safari last week. This 260-mile race was undoubtedly the hardest physical challenge I have ever faced. I knew that I would learn some things about myself along the way — things that you can only learn when you find yourself far from the starting line and a long way from the finish line. 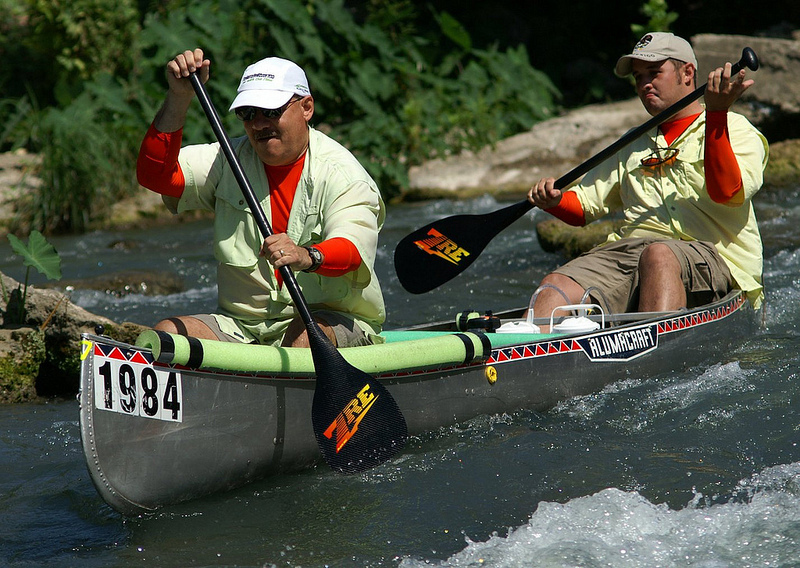 A little more than fifty miles into the race I came to the realization that this was not one of our training runs and that we still had days of paddling to go. I had determined before the race that quitting was not an option and that I would not disappoint my son. Making these decisions ahead of time was wise and helped me to overcome the temptation to do otherwise along the way. One thing I learned is that temptation is always at your heels when you attempt to do hard things. When you are physically exhausted, temptation will raise its ugly head and try to convince you that you have gone far enough. We have choices when we hit the wall. We can turn around, pack it in, or paddle on. As hard as it was at times, I chose to paddle on and thought about Pausch’s words, “Brick walls are there for a reason. They give us a chance to show how badly we want something.” Jonathan helped me to push past these barriers by moderating my nutrition or by allowing me to take a five-minute dip in the river or by letting me rest for a few minutes. I learned that little adjustments like these along the way revived me, gave me a second wind, and strengthened my resolve to make it to the next checkpoint. I know that Jonathan could have finished the race in faster time had he had a stronger partner than me. I’m grateful to Jonathan for being patient and for helping me to fulfill a dream one paddle stroke at a time. At the finish line a lady named Tammy came up to me and took my picture. She told me that she had met Jonathan the year before and that he had said he really wanted to do this race with his Dad. “When my husband and I saw you with Jonathan,” she said, “we both cried.” I cried, too — not because I was in any physical pain but because my son had invited me to do something hard with him and we made it to the finish line. I would never have attempted to do the Texas Water Safari had it not been for Jonathan. As I have said before, I am not crazy about canoeing. It’s not something that I am particularly passionate about or that I love. However, the reason I paddled 260 grueling miles in a canoe is because I love my son (and my daughter, our team captain, who also encouraged me at each checkpoint). I have grown and made a lifetime of memories because my son encouraged me to do something hard with him. It was worth every one of the estimated 250-thousand paddle strokes from start to finish. Running Cottonseed Rapids on the San Marcos River. Amen! He’ll never forget it either. He’ll be telling your grandchildren, and HIS grandchildren about it one day! I’d love to hear the lessons the Lord taught him on this adventure too. Would he write a post? It’s cool to think that an adventure like ours will be passed on to the next generation. Jonathan has told bits and pieces on his Facebook. Maybe he will write a guest blog someday and share his reflections. Nutrition, breaks and encouragement are excellent ways to get through the wall! And your own personal resolve was key as well. Congratulations on your finish, and on building life-long memories with your son. Thanks, Kay 😉 I have not been able to stop thinking about those four days on the river. Although it was tough I just can’t help but smile for having shared the experience with Jonathan. Your son will never forget the time you spent with him. You are a great model for father Omar. Bless you! I will definitely have to retrofit our paddles with the Go Beyond logo. 😉 That would be cool. Thanks for your kind words, Steve. Look forward to seeing you in Cambodia in September.